*Present address, Multi Imaging Centre, University of Cambridge, Downing Street, Cambridge CB2 3DY, UK. P. Török is on leave from the Central Research Institute for Physics, Hungarian Academy of Sciences, Budapest, Hungary. 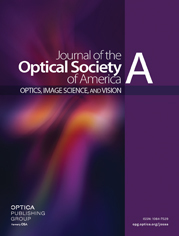 The treatment of the diffraction of electromagnetic waves for light focused by a high numerical aperture lens from a first medium into a second medium [ J. Opt. Soc. Am. A 12, 325 ( 1995)] is extended so as to provide an analytical solution for the diffraction integrals by means of polynomial expansion. Methods are proposed and used to eliminate strong oscillations from the diffraction integrals. The aberration function is analyzed and expanded in terms of Zernike polynomials. The Zernike coefficients are obtained, and the error of the expansion is determined. It is shown that when the relative refractive index of the second and first media is larger than unity, the higher-order Zernike coefficients are independent of the refractive index of the second medium. A physical interpretation is given to explain this behavior. Pictorial representation of the first 25 Zernike polynomials is also presented. a Note that the first row corresponds to − Kk (2/sin2α − 1). The numbers correspond to a numerical aperture of 0.9.